Unlike camcorders, filming a movie is usually recording on separate video and audio devices, instead of one. Have you ever seen a "behind the scenes" clip for a movie and wondered what the little board they use when they do the countdown to start a scene is all about? That little device is a key component of the film making and video production industries called a clapperboard. Unlike camcorders, filming a movie usually occurs on two tapes instead of one. It is important to make sure the sound and video playback correctly together in order for the movie to be a complete product. The clapperboard is a device that production crews use to help the film editor synchronize the picture and sound in a film. The way this is done is by matching up the visual action of the clapstick being shut in the film with the very distinct sound the device makes in the audio track. In this way the film tape and audio track have a distinct synchronization point. 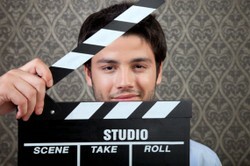 The clapperboard, also known as a film slate or clapper is comprised of two parts. The larger section on the bottom portion is called a chalkboard slate. This is where the information that identifies the upcoming scene and which take is being done. The second component is the clapstick, which is the thin stick at the top that is used to make the audible clap sound. These two components represent the joining of what used to be two separate functions. In an effort to reduce the amount of people required and to make a more streamlined process, designers joined the two components giving us the clapperboard that is still somewhat in use today. More recently there has been a shift from the traditional audible clapperboard to digital clappers. The big difference between the traditional film slate and the newer digital clapper is that instead using the audible clap as the reference point in the audio tape, there is a timer that is synchronized with the camera. This provides a time snapshot for the editor to reference for synchronization. The modern clapperboards also include advanced meta data and logging features. Through its life the clapperboard has seen many revisions, and most likely will see more as technology advances and film making needs change. The fact remains that as long as film makers continue to use separate tapes for audio and visual, they will need the clapperboard or something like it to continue to facilitate the process of synchronization for seamless viewing pleasure. This long-awaited upgrade to an elegant Mac 3D app promises significant render speed increases.